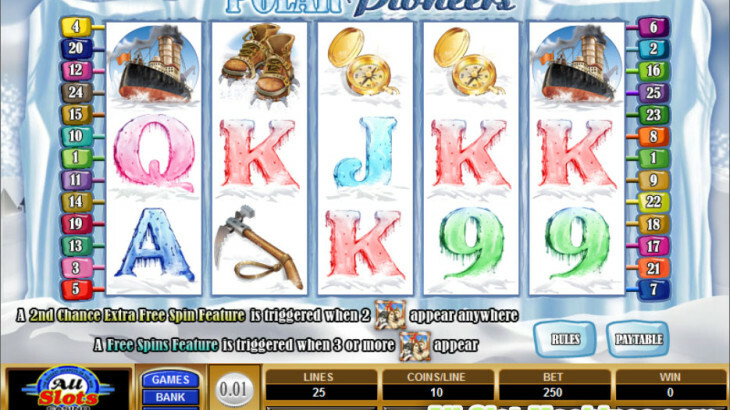 This a favourite at the casinos en ligne in Canada and France – the heroic era of the Arctic explorers is the theme for this new 5 reel 25 pay-line casino video slot, POLAR PIONEERS. This video slot is super cool in every respect, with Scatters, Wilds, Free bonus slots, spins-within-free-spins and a new second re-spin feature, topped off with a chance to double or quadruple your money in a Gamble feature. An exploratory glance at the brightly coloured graphics used to present the theme tells you that this game is set against a backdrop of the vast white wastes of the Arctic, with a rugged explorer, his faithful huskies and the tools of the trade, from a compass and an ice-pick to the icebreaker that brought these intrepid adventurers to the great frozen continent. But the winning opportunities are red hot rather than ice cold in this game. You won’t be disappointed with these online casino bonuses! Three Huskies on the reels and you’re on your way to 10 Free Spins which deliver a 2x Multiplier to fire up your pay-line wins, and spicing up the action is the added advantage of more free spins that can be generated within the Free Spins. That’s not all – in a new feature triggered when two Huskies appear on the reels, this online casino game holds the reels where the dogs appear and then gives a further opportunity for success by re-spinning the remaining reels with a 1x multiplier, that can start another 10 spin bonanza if you’re luck’s in! Helping you build more winning combinations is the Explorer symbol, which acts as the Wild in the game, and providing a final chance for some true gambling action, we’ve added a Gamble feature where players who correctly choose color and suit can double or quadruple their winnings. The wagering range on this outstanding casino slot is from 0.01 to 0.10 a line, with a maximum bet per spin of 50.00. With the right combination of bets and good fortune that can deliver a top prize of 30 000.00 in the base game and a bank-boosting 60 000.00 in the abundant Free Spins.